The Carriage of Dangerous Goods (CDG) Operation beings today, Monday 18 February. The Surrey and Sussex Roads Policing Unit will be supporting the national week of action to target goods vehicles carrying dangerous goods, such as petrol, diesel, chemicals and other hazardous goods on our roads. The purpose of the operation is to check operators are complying with the health and safety laws in relation to the carriage of dangerous goods, in order to make the roads safer and prevent any serious injuries or fatalities, should the vehicles be involved in a collision. A collision involving a vehicle containing dangerous or hazardous goods has the potential to be a very serious incident, presenting a high risk of serious injury or even death for our road users and emergency services. With the national security level being severe, there is also the threat that these types of vehicles could be used in acts of terrorism. The operation runs for 7 days (Monday, 18 to Sunday, 24 February) with officers deployed to strategic locations with the intention of identifying and stopping vehicles suspected of any offences. 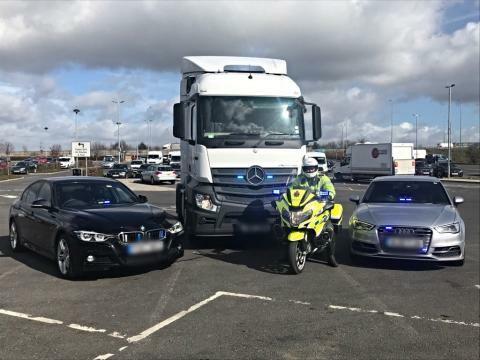 Vehicles will then be escorted to a check-site, where officers from the Surrey and Sussex Roads Policing Unit, along with partners from the Driver and Vehicle Standards Agency (DVSA) and the Metropolitan Police, will conduct further checks. We will be using the #CDGOperation hashtag to provide further updates on our operational activity and results of the campaign via social media. If you know someone is driving dangerously and putting other lives at risk by not complying with the relevant health and safety laws, call 999. Alternatively, people in Surrey can text officers on 65999 with the details of people they suspect of dangerous driving. You can also contact the independent charity Crimestoppers anonymously on 0800 555 111 or report it online (www.crimestoppers-uk.org). The campaign is being run in conjunction with Sussex Safer Roads Partnership and Drive SMART in Surrey.